Recently I have seen a few people posting on the forum asking how you can hide and show items in APEX 4 and above, because of this I thought I would do a quick example. The example is based on a simple registration form where a user can either choose to complete a private registration or register with company details. I didn’t require the company information from the user if they was registering privately so I wanted to hide these fields. The next step is to create a dynamic action that will hide and show the various items. 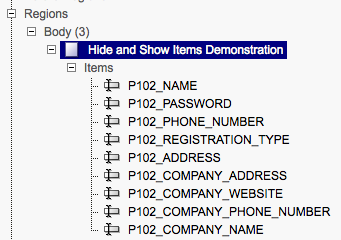 So in the true actions I wanted to show the company items but hide the address item as I don’t need both a company and personal address. I have also checked the box when creating them that states that I want it to fire on page load. This is a very simple way to hide and show items in a page dynamically without the page needing to be reloaded each time the select list is changed. Previously jQuery was used to perform such actions but with the inclusion of dynamic actions in APEX 4 this became very simple using the approach above.